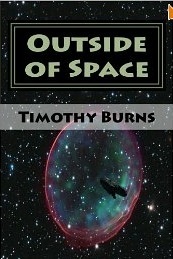 I recently came across a new indie author who shows great promise, Timothy Burns. This is his first (and only, as far as I know) novel. Tobar Rus, a general technician aboard the huge ancient starship Zaspar's Pride, imperils his ship and crew when his attempts to investigate an alien artifact the size of a star end up stranding the generational ship far from any hope of rescue. In a desperate attempt to save everyone he knows, he ventures to the artifact and becomes trapped inside it where he discovers a pocket dimension that contains a single star and lone planet. On this world are two distinct cultures, the magic-using surface dwellers and a long-isolated race of cannibalistic wizards. When Tobar arrives, the Haxalantha wizards are about to explode out of their under-world caverns and devour the surface peoples. With the help of the sorceress Sapphire, her winger lover Kyri and their valiant companions, he escapes the clutches of these sadistic killers and, after long struggles, eventually makes contact with the alien intelligence that created the reality bubble. This is a rather long book at 600+ pages, and the first offering by a first-time writer, but well worth the read. The blending of technology and a realistic magic system add up to quite an enjoyable romp in a book that can best be described as hard science-fiction/fantasy cross-over. It is available as a trade paperback and Amazon Kindle ebook. For more reviews or to buy Outside of Space from Amazon.com, click here.